A tiny calf is a real-life mini moo after being born one-tenth the average size – and is now tipped for a place in the record books. Lil' Bill shocked his owners at birth, weighing in at a mere 4.5kg but looking just like every other cow, except smaller. 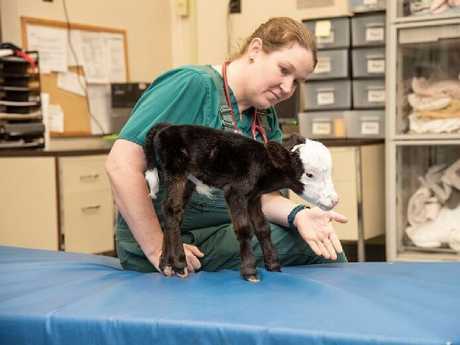 Concerned for his health, Lil' Bill's owners took the tiny calf to the Mississippi State University College of Veterinary Medicine. The university posted on its Facebook page that the case of Lil' Bill left veterinarians scratching their heads. "He was born weighing a little over one-tenth of what newborn calves typically weigh," the post said. "Occasionally, we get a case that has us scratching our heads a bit. Lil' Bill is one of those cases." News of the tiny star's arrival last week comes just days after the world was introduced to a mammoth steer in Western Australia which has since been crowned the world's biggest cow. Knickers, who weighs 1.4 tonnes – 300 times more than Lil' Bill – was saved from the slaughterhouse because he was deemed just too big to kill. 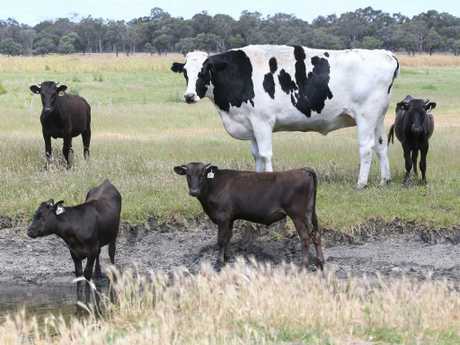 Standing 1.95m tall, the seven-year-old Holstein Friesian's startling size meant he was too heavy to go to the abattoir. Cattle farmer Geoff Pearson said: "I wouldn't be able to put it through a processing facility," he said. "So I think it will just live happily ever after." Revelations of the giant's escape from the chop soon sparked tales of more amazing bovine behemoths scattered around the globe. And according to Guinness World Records, the tallest steer on the planet can be found in Italy – a 201cm Chianina ox named Bellino.